Last season, I repeatedly sung the praises of Ernesto Galán. He is a former center-back and current right-back - quick, defensively excellent and surprisingly adept going forward and covering for players. However, and quite surprisingly, I never actually wrote about him - his career and his story. Which is a shame, but better late than never I guess. Ernesto Galán was struggling. His youth career had started with Villaviciosa de Odón releasing him and ended with Getafe releasing him too. His senior career had started with Segunda B side Móstoles in the 2005-06 season, playing 32 games under four different managers, but the team was relegated. Having played in Madrid all his life, and with his career in jeopardy, the decision to leave was a huge gamble. But he did - in 2006 he signed for Lleida. It was a risk - and it certainly felt like one at the beginning. Felipe Miñambres gave him just three league games in six months, and he had to pack his bags once again for a loan move to Puertollano for the rest of the season. But the managers changed and chances came - under Javier Zubillaga in the 2007-08 season he became the primary rotation option in defense, and played 23 games. And in the following season under Emili Vicente, a Lleida legend as a player and a Lleida legend-in-the-making* as a manager, Ernesto became an undisputed starter. Ramón Planes had been Lleida's sporting director during the 2006-07 season, and subsequently joined Espanyol's technical secretariat. Two years later, with Planes as sports director, one of his first signings was that of a Segunda B player from Madrid. 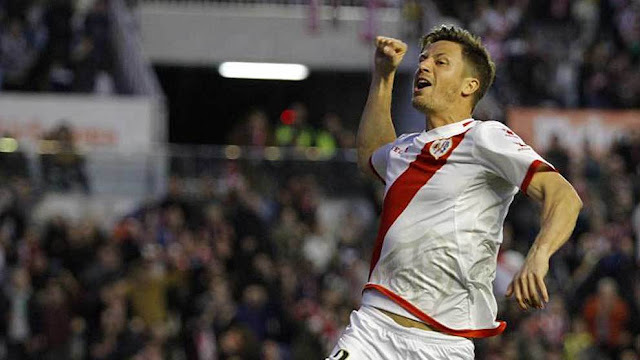 Ernesto Galán would be given his La Liga chance, but not immediately - Segunda side Girona would have his services for the 2009-10 season. It was his first ever chance at professional football - and he took it with both hands. Ernesto Galán became an undisputed starter, playing a whopping 3285 minutes (second most in the squad) and being a consistent part of an inconsistent team that would have been relegated on the final day if not for a last minute penalty. Espanyol saw that, and gave him his La Liga debut in 2010. Mauricio Pochettino was putting faith in a 24 year old defender who had, just over a year ago, been playing in the theoretically amateur Segunda B. But luck is a wonderful thing when it's on your side. But it is horrifying to watch when luck runs out. Everyone was horrified when it happened. He had quickly become Espanyol's most consistent defenders, and it was just the sixth game of the season, against Real Sociedad. The center-back attempted to slide in and nick the ball clear and out of play on the half-hour mark, but his leg folded awkwardly underneath him, and he immediately had to be replaced. It was a broken leg - a broken right fibula to be exact - and his La Liga dream had come to a grinding halt. Things were never the same - in the 2010-11 season he would go on to play a further 17 games in the second half of the season, but was demoted to third choice in the 2011-12 season. And as the 2012-13 season went on with Ernesto not even making the bench, it was clear that he had to drop down a division. And he did - staying in the Segunda ever since. Xerez took him on for the latter half of the 2012-13 season, but the team were relegated. Since then, Las Palmas, Alavés** and Mirandés have had him for a season each - only at the latter club was he given a chance, by manager Carlos Terrazas. And in 2016, with Ernesto Galán once again looking for a club, it was once again a newly incoming sporting director by the name of Ramón Planes who brought the Madrid-born player back to Madrid. Back where he belonged. *He managed the club from 2008-11 until its dissolution - and even coached the newly formed club Lleida Esportiu for a further season. ** During the 2014-15 season at Alavés, he was benched by a marauding right-back by the name of Unai Medina. Three years later, as we speak, Baiano might be doing the same.